In the comments to my Stripes! post, several of you asked about how I used the barcode to calculate the stripes for my warp. It's possible to just visually guesstimate the relative width of the stripes, but for those of you who, like me, want to be a bit more accurate, I'll show you how I did it. 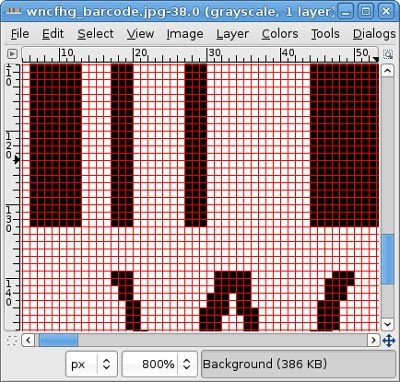 The easiest way is to apply a grid to the barcode. 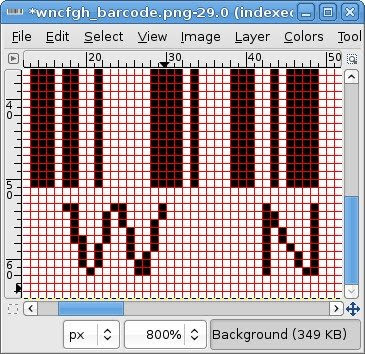 I did this by opening the barcode image in my photo editor (GIMP), and adding a grid (View > Show Grid). I had to try several different grid sizes to get the bars to fit. Any grid can give you an approximate idea of the relative width of the stripes, even if they don't fit the grid exactly. To get an accurate measurement, I found that the best grid size was one pixel. This meant that I had to zoom the image 800% to see the grid. As you can see however, that's a lot of pixels to count! Being the lazy/impatient sort, I decided to try resizing the image. In the photo above, the narrowest stripe is three grid units wide. To simplify counting, I resized the entire image to about 1/3 the original size. My narrowest stripes were now one grid unit wide, and the widest were six. Much easier to count. I ran the barcode off on my printer, and wrote the down the number of units on the printout as I counted them. The next step was deciding how many warp ends to make each unit. To get the required 18 inch width for the towel, I needed 702 ends for waffle weave in 10/2 cotton, sett at 30 epi. I had a total of 112 units in the barcode, not counting borders. By dividing 702 by 112, I discovered that I could make each unit six warp ends wide and have some leftover for borders. That means that my narrowest stripes are six ends, and the widest stripes are 24 ends. In reality, as I've written this out, I have realized that I made some mistakes when I counted the units. But! When visually comparing my warp to the barcode, no one will know. Which goes back to visually guesstimating, which would work well too. After all, if we don't point out our errors, very few folks will see them on their own. Obviously this would be a whole lot easier for knitted stripes. For weaving it just took a little more counting and calculating. Does this make sense? If you have any more questions, just let me know. And let me know when you post photos of your barcode projects! How ingenious! And as for mistakes, with any system you use, you are in control. If there is something the system would have you do which doesn't quite work, you are quite free to change it. The systemic calculation is only the beginning of the design. You have to decide if you like everything about that design. I thought at first that I'd just enlarge my barcode, print it out and measure the percentages. but then I realised that if I use them in knitting - I can just use the enlarged printout and put the grid on, that I usually need for picture knitting etc. same as for you, the printout didn't match the grid 100 % - but well enough to let me count rows and stitches! I think it'll be a while until I start the socks with the barcode though - I started the shadow knitting lion yesterday and I don't want to end up with 12 single socks with different hp patterns in a box:) very tempting with socks! Peg, I think that's why designing my own is so much more satisfying than using a project pattern. I'm still capable of making mistakes either way, but on my own, I not only learn more, but I enjoy the process more. Bettina, I love the idea of barcode striped socks! You've just given me an idea for Christmas gifts! I know - can you believe that Valerie pointed out her missed block?! I thought her fabric was spectacular. Aren't we our own harshest critics? As always, you astound me with your inquisitive investigations. I'm still trying to finish treading for Ms and Os dishtowels. That's why I enjoy your blog - I can't keep up with you but I can read up with you. Your barcode stripes are so interesting. I have also used binary to create stripes on my projects. There are binary generators online where you can type in the word and it gives the 1s and 0s. Each letter is an 8 bit block. From that I have knit stripes using a color for the 1s and black for the 0s. It came out pretty neat. Sharon, well, if I had a job like you do, I wouldn't have nearly as much time to explore and play. I think you're quite productive with the time you have! Lavendersheep, what another great idea! Thank you for mentioning it. I'll have to add it to my list of "must tries." I guess that's why they call it a "job" - anyway, go take a look at Marie's new loom. It's spectacular!